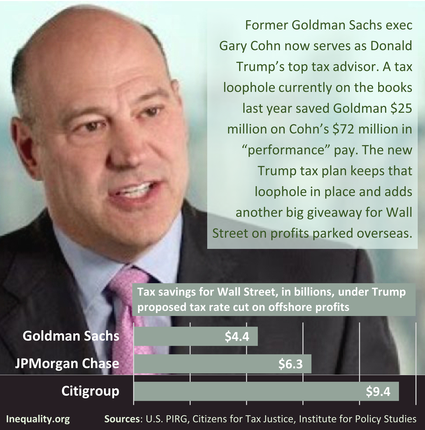 Wall Street banks are already expert tax-dodgers. According to Institute on Taxation and Economic Policy data, nine of the largest and most profitable U.S. banks paid an average federal tax rate of only 18.6% between 2008 and 2015 — far less than the statutory rate of 35%. By using various loopholes, these banks avoided paying about $80 billion in taxes that could’ve helped make college more affordable, provided preschool for millions of children, or helped repair our aging infrastructure. Tax plans from President Trump and House Republicans would only make it easier for Wall Street to rig the tax code and avoid paying their fair share.